When creating a spreadsheet with Google Sheets you may come across the need to create one or more drop-down lists within its cells. These easy-to-navigate menus can prompt a user to choose from a list of items and instantly modify the output in other cells based on their selection. Perhaps you'd like to simulate a shopping cart experience, displaying different prices for each item in a list. Maybe you're a teacher looking to calculate final grades for each student in your class, populating their names in a handy drop-down list rather than having an unwieldy design where everyone takes up their own row. No matter the need, creating and modifying drop-down lists in Google Sheets is a fairly straightforward process once you get the hang of it. Follow the instructions below and you'll be an expert in no time. Google Sheets drop-down lists can be created on Android, Chrome OS, Linux, macOS or Windows operating systems. While they can be viewed and utilized on iOS (iPad, iPhone, iPod touch) devices, they cannot be created or manipulated. 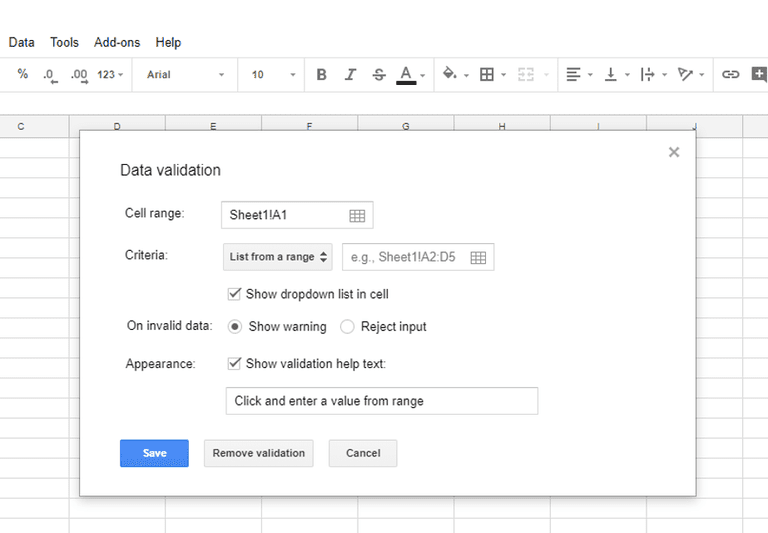 A drop-down list or other data validation method can be created and applied to one or more cells within a Sheets spreadsheet via most major desktop/laptop web browsers, although Google's own Chrome application is recommended for optimal performance. Select the cell or group of cells where you'd like to place a drop-down list. Click on Data in the Sheets menu, located towards the top of the screen. When the drop-down menu appears, select Data Validation. The Data validation interface should now be displayed, containing several configurable options. The first, labeled Cell range, specifies the exact location where your drop-down list will reside. The Criteria setting contains its own drop-down menu which offers the following options, each one dictating specific data requirements that the spreadsheet's user must follow when entering or selecting an item in or from the aforementioned cell range. If the value chosen in the Criteria section causes a drop-down list to be created, a checkbox labeled Show dropdown list in cell will also be provided. Enabled by default, removing the check mark will dictate that the specified data validation will take place in the selected cell(s) but no drop-down list will be shown. This can be useful if you want the spreadsheet's end user to only have the option of entering data manually, as opposed to choosing it from a list. The next section, labeled On invalid data, controls what happens when the spreadsheet's user enters something into the selected cell(s) that fails the aforementioned data validation. The two available options, each accompanied by a radio button, allow you to show a warning message in this instance or to reject the user's input altogether. The final setting, Appearance, dictates whether or not text is shown to give the end user a better idea of the type(s) of values that will be accepted within the respective cell range. To activate this virtual helping hand, place a check mark next to the Show validation help text option by clicking on the box once. Next, enter or modify the exact text that you wish to display. Once satisfied with your selections, click on the Save button. A drop-down list or other data validation method can be created and applied to one or more cells within a spreadsheet on your Android phone or tablet via the Sheets app. Open a new or existing spreadsheet in the app. Tap the main menu button, represented by three vertically-aligned dots and located in the upper right-hand corner of your screen. When the drop-down menu appears, select Data Validation. If the value chosen in the Criteria section causes a drop-down list to be created, an option labeled Show dropdown list in cell will also be provided. Enabled by default, disabling this option by selecting its accompanying slider (turning it from blue to gray) will dictate that the specified data validation will take place in the selected cell(s) but no drop-down list will be shown. This can be useful if you want the spreadsheet's end user to only have the option of entering data manually, as opposed to choosing it from a list. The Appearance setting determines whether or not text is shown to give the end user a better idea of the type(s) of values that will be accepted within the respective cell range. To activate this virtual helping hand, tap the slider next to the Show validation help text option so that its color turns from gray to blue. Next, select EDIT and enter or modify the exact text that you wish to display. The bottom section, labeled On invalid data, controls what happens when the spreadsheet's user enters something into the selected cell(s) that fails the aforementioned data validation checks. The two available options, each accompanied by a radio button, allow you to show a warning message in this instance or to reject the user's input altogether. Once satisfied with your selections, tap the SAVE button. Take the following steps to modify or remove a drop-down list or other data validation criteria from a particular cell range. Select the cell(s) containing the drop-down list or other data validation criteria that you wish to modify or remove. The Data validation interface should now be displayed, containing several configurable options. If you'd like to modify cell behavior, make the desired changes and click on the Save button to apply them instantly. If you'd like to remove the drop-down list or other validation criteria completely, click on the Remove validation button. The Data validation interface should now be displayed, containing several configurable options. If you'd like to modify cell behavior, make the desired changes and tap the SAVE button to apply them instantly. If you'd like to remove the drop-down list or other validation criteria completely, tap the REMOVE RULE button.